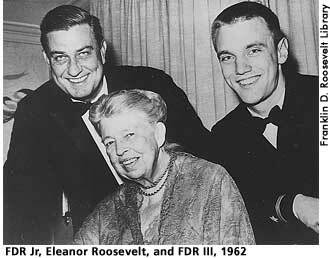 Franklin Delano Roosevelt, Jr, the fifth child of Franklin and Eleanor Roosevelt was a lawyer and a politician. As a politician he favored continuation of many of his parents' policies and worked to secure strong federal and state support for public housing, fair employment practices and civil rights. Known in the family as "Brother" or "Brud," he and the Roosevelts' youngest son, John, spent considerable time with ER during their childhoods in part because she was a more relaxed parent and in part because of FDR's paralysis. At the same time, his interest in politics enabled Franklin Jr. to forge a close relationship with his father. After graduating from Groton and Harvard, Franklin Jr. studied law at the University of Virginia. He then joined FDR's 1940 reelection campaign, coordinating youth activities for the Democratic National Committee and working with various Roosevelt college clubs. He also practiced law until he went into the navy in 1941. When the war ended, Franklin Jr. practiced both law and politics. For the most part his political positions matched ER's and he encouraged her to accept Harry Truman's offer to appoint her to the United States delegation to the United Nations. Franklin Jr.'s own political career was a combination of appointive and elective offices. He was chairman of housing activities for the American Veterans Committee (1945-47), national vice-chairman of Americans for Democratic Action, and vice chairman of the President's Civil Rights Commission (1949). Beginning in 1949, he also served three terms in Congress representing New York's Twentieth Congressional District. His loss of the 1954 New York gubernatorial nomination to Tammany-backed candidate Averell Harriman effectively torpedoed his elective political career and led to ER's involvement in a subsequent reform movement that resulted in the demise of Tammany and its boss, Carmine DeSapio. Franklin Jr. also lost two later bids for elective office, one for New York state attorney general in 1954 and another bid for governor on the Liberal ticket in 1966. In between those two campaigns, Franklin Jr. broke with ER over the presidential candidacy of John F. Kennedy in 1960. (Previously they had disagreed when he and his brothers, James and Elliott, had supported Dwight Eisenhower for the 1948 Democratic presidential nomination. Eisenhower later declared himself a Republican.) Despite ER's opposition, Franklin Jr. campaigned for Kennedy in the crucial West Virginia primary, which Kennedy won. After Kennedy's election he named Franklin Jr. under secretary of commerce, a position he held until 1965 when President Lyndon Johnson named him head of the Equal Opportunity Commission. He remained in that position until 1966. As his political career waned, Franklin Jr. became increasingly involved in business, importing foreign cars and working in the banking industry. He also raised cattle on his farm in Dutchess County, New York. After ER's death in 1962, he served as chairman of the executive committee of the Franklin and Eleanor Roosevelt Institute and as ER's literary executor. He also worked on the development of the Roosevelt Campobello International Park. Franklin Jr. was married five times and had five children. He died of cancer in 1988. Graham, Otis L., Jr. and Meghan Robinson Wander. Franklin D. Roosevelt: His Life and Times. New York: Da Capo Press, 1985, 368-369. Lash, Joseph P. Eleanor: The Years Alone. New York: W.W. Norton & Company, 1972, 36, 91, 147-148, 274-275.